If you're a fan of Disney animation or just like to hear a good Hollywood comeback story, then you must go see the new documentary, Waking Sleeping Beauty. The film, directed by Disney producer Don Hahn (Beauty and the Beast, The Lion King) covers the tumultuous time period of 1984 to 1994, a time when Disney Feature Animation was at an all-time low and then went on to make some of the most successful animated features ever: The Little Mermaid, Beauty and the Beast, Aladdin, The Lion King, etc. The documentary, excellently narrated by Don Hahn and told through archival footage, is filled with so many gems. There is a lot of never before seen material, including interviews and behind the scenes footage of animation meetings, press events, and company parties that took place during that ten years. All the arguments, wisecracks, and drama have not been left out. But, what I found most entertaining though was the home video recordings of the animators at work/play - I'm not sure which? And what do I mean by that? Well, for example, video cameras were never really allowed into the animation building at the Disney lot. But, in the early 1980s, when some of the animators thought they were going to be laid off in a week, they figured why not bring a camera to work and record what was going on at the studio. They figured, "what's the worse that could happen? Be fired?" And so, the animators, in their animation building, reennacted for the camera scenes from Apocalypse Now, to demonstrate the work environment - fake explosions and bodies flying, etc. Other fun home video moments included interviews with the then very young Ron Clements and John Musker, before they would go on to make films like Little Mermaid and Aladdin, or shots of a pre-Pixar John Lassetter and a totally deadpan close-up on Tim Burton (still looking like an awkward teenager) at his drawing desk. Its footage like this that really makes you feel like a fly on the wall looking in on the world of these animators. The documentary begins at a time when Disney animation was close to coming to an end. The remaining old animators, those animators who started in the days when Walt Disney was still around, were set in their ways and often at odds with the new young animators. There was no cohesion or leadership and this created conflicts resulting in poor films. The Disney magic had been lost and the company was making flop after flop. It looked like the Disney animators might be laid off and that the whole company could possibly fall apart. Then Roy E. Disney, Walt's nephew and the son of Walt's business partner Roy O. Disney, fought a long battle to bring new leadership to the company. In short, this resulted in Michael Eisner, Frank Wells, Jeffrey Katzenberg, and Peter Schneider joining the company at the top. This new leadership began to make some drastic changes at Disney, but everything was far from happy. There were many battles fought between the animators and the new executives at the company, and even amongst the executives themselves. Nonetheless, the infusion of these new leaders at Disney and the new generation of Disney animators was the perfect mix of talents that resulted in a "second golden age of Disney." Hahn's documentary provides an insiders look at all the drama that took place during this period in Disney history. It's sometimes funny, sometimes sad, but in the end an inspiring story. Any fan of Disney should try and see this great film if they can. Currently, Waking Sleeping Beauty is only playing in a few cities: Burbank, Los Angeles, San Francisco, Chicago, and New York. Visit the official site here to get a full listing of theaters. However, at the screening I attended last night in Burbank, Don Hahn who was on hand to answer questions afterwards, mentioned that the film is performing well and will be moving on to other cities - so if the film isn't playing near you now be on the lookout. He mentioned screenings in Florida would be coming up next. Speaking of Don Hahn attending the screening in Burbank last night, he was fantastic about sticking around and answering many questions from the audience. He was informative, honest and very funny as well. One of my favorite moments was when someone from the audience asked Hahn if he had any response from Eisner, Katzenberg or any other key players in the film about the documentary - mainly if any of them disagreed with the way Hahn presents things in the film. Hahn responded by saying they wanted to be upfront with everyone in the beginning of making the film, that they "didn't want to stab anyone in the back, but wanted to stab them in the chest." Below is a video clip of that funny moment that my wife recorded. It was only recorded on a small photo camera so the picture quality isn't the best, but the audio turned out alright. After the screening Hahn was nice enough to stick around long enough to sign things and take pictures with people. Below is a photo of my wife and I with Hahn at the theater. Next month (April) will be the very first Turner Classic Movies Film Festival. Set to take place in Hollywood, the festival is kicking off with the world premiere of a new restoration of one of my favorite films about show business, A Star is Born (1954). I wish I could attend, but the festival is a bit pricey and not in my budget this year, so instead, for the rest of you unable to attend, how about we get into the spirit of this classic film by visiting some of the locations from this movie? In short, A Star is Born (1954) tells the story of film star Norman Maine (James Mason) who's career is on the decline. Norman falls in love with a young singer Esther Blodgett (Judy Garland), who quickly rises to stardom as Norman's career continues to crash. At the beginning of the film, James Mason appears at a star-studded event taking place at the Shrine Auditorium near downtown Los Angeles. It's at this event that Mason first encounters Garland. At the event Mason, because of his drunkenness, nearly makes a fool of himself in front of the large audience at the Shrine. Fortunately, Garland, who is performing at the show, saves Mason from embarrassing himself. Later in the film, Mason is seen at the Coconut Grove night club located in the former Ambassador Hotel. He's looking to pick up any young starlet that might be around, when the host at the Coconut Grove informs Mason of another night club where Garland usually performs at. Mason then leaves to track Garland down. Mason looking for women at the Coconut Grove nightclub. The Coconut Grove was a popular nighspot for the Hollywood stars of the 1920s, 1930s, and 1940s. Everyone from Douglas Fairbanks and Mary Pickford to Jimmy Stewart and Ginger Rogers went to the Coconut Grove for a night of dancing and drinks. In 1939, the Academy Awards Ceremony even took place at the Coconut Grove and was hosted by Bob Hope. The nightclub was located in the Ambassador Hotel, which is also tragically famous for being the location of Robert Kennedy's assassination. 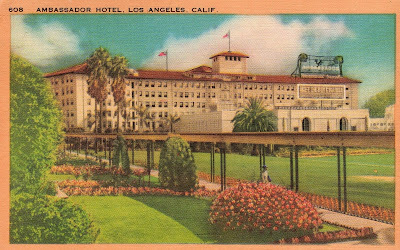 Unfortunately, for Los Angeles, the landmark that was the Ambassador Hotel was torn down to make room for a new school. 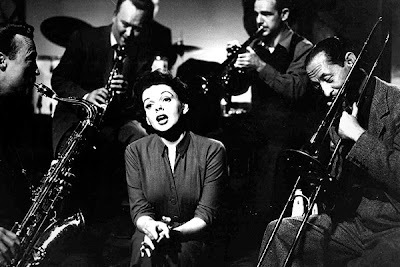 According to the book A Star is Born (1954): The Making of the 1954 movie and its 1983 restoration, the Coconut Grove nightclub seen in the film was a recreation built on a soundstage at Warner Bros. Studios. Above is a screenshot of the Ambassador Hotel and below is one of my postcards of the Ambassador Hotel. The postcard was actually sent in 1951, close to the period when filming of the movie took place. Garland's character lives at an apartment complex located in West Hollywood called the Oleander Arms. The Oleander Arms apartments, which once stood at the corner of Crescent Heights and Fountain, has since been torn down. In the film, the actual apartment was used for the exterior shots and the inside of the apartment was filmed on a soundstage at Warner Bros.
Site of former Oleander Arms Apartment, Crescent Heights Blvd. & Fountain Ave.
Mason goes to visit Garland at the Oleander, only to find that she can no longer afford to live there, and has since moved to a boarding house in downtown Los Angeles. Below are images from this part of the film comparing the same locations as they appear today. Looking across Crescent Heights Blvd. Mason drives North on Crescent Heights Blvd. Crescent Heights Blvd. and Fountain Ave.
Mason crossing Fountain Avenue at Crescent Heights Blvd. After Mason learns that Garland has left the Oleander Arms apartment building he finds her at a downtown Los Angeles boarding house in the Bunker Hill neighborhood. This location took some detective work to find. The Bunker Hill neighborhood of the 1950s is an extinct neighborhood. Nearly all the buildings have been torn down, or relocated, making the neighborhood completely unrecognizable. Below is a screenshot of Mason arriving at Garland's boarding house. In the screenshot there is a tall building on the right side that had a unique design, so I tried searching through old Bunker Hill photographs to see if I could find this same building. Eventually I did, and in one photo, I could make out that the tower at the top said Richfield, as in the Richfield oil company. 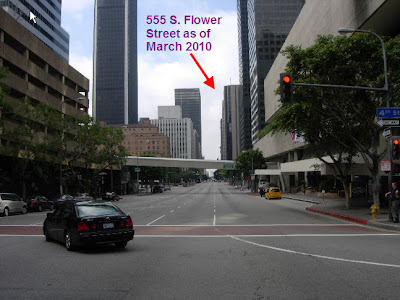 After doing some more searching I found out that the Richfield Oil Building used to be located at 555 S. Flower Street in downtown Los Angeles. If you compare the screenshot to the photo I took of the same location as it appears today you can see how much the area has changed. Mason arriving at Garland's boarding house. Notice the Richfield Oil Building on the right. Looking down Flower Street, downtown Los Angeles. The arrow points out 555 S. Flower, the address where the Richfield Oil Building once stood. To support herself, Garland takes a job at Roberts Drive-In in Hollywood. According to the book A Star is Born (1954): the making of the 1954 movie and its 1983 restoration, filming took place at the intersection of Sunset and Cahuenga, but I wasn't sure at what corner the drive-in once stood. I found a great photo of the Hollywood location of Robert's Drive-In, in another book: Car Hops and Curb Service: A History of American Drive-In Restaurants 1920-1960. In the photo you can see the whole restaurant and how it appeared as well as the Broadway Hollywood building in the background. This lead me to believe that the drive-in stood at the northeast corner of Sunset and Cahuenga. To be sure I continued to search further. I came across some photos of another drive-in that used to be located at this same corner called Scrivner's. Both the Scrivner's drive-in and the Roberts drive-in looked like they could have been the same building, only slightly remodeled, and both drive-ins show the Broadway Hollywood building in the background. I have to assume that the Robert's drive-in was the predecessor to Scrivner's and was located on the same corner. Check out this Hollywood Photograph Collection to see an image of Scrivner's. Broadway Hollywood building still in background. Garland, however, does not work long at Roberts drive-in. She eventually is brought to Niles Studio (really the Warner Bros. Studio) to be turned into a film star. Below are some images comparing the Warner Bros. studio as it appears in the film to how it appears today. Mason arrives at the Studio. Warner Bros. alleyway. The soundstage on the Right is now the home of The Ellen Show. Mason running up the stairs of the make-up department. The make-up department building is mainly offices. Garland is being led to the projection room to meet studio head Oliver Niles. Norman Maine's (Mason) studio dressing room. Norman Maine's dressing room is the Joel Silver production offices today. Mason & Garland outside the dressing room. Looking down the same alley at Warner Bros. today. Same view of buildings in background seen above. In the movie, when Garland's character is going to have her big Hollywood film preview, that theater was actually located on the Warner Bros. backlot. See below photos. Mason & Garland arrive at the preview. Warner Bros. backlot. Site of Garland's preview. Garland exits the theater after the preview. Facade of the theater exit. Studio publicist Matt Libby & studio head Oliver Niles walking around studio. Looking down same studio alley today. That's the WB Commissary in the background. The building to the right is the Eastwood Scoring Stage, named after - Clint Eastwood of course. At one point in the film, Mason's character, who hasn't touched a drink of alcohol for a while, ends up giving into his addiction after being embarrassed. That scene took place at the Santa Anita Park horse racetrack. I was actually at the track for the first time last month, and I must say, it is a beautiful place. The art deco building dates back to the early 1930s. 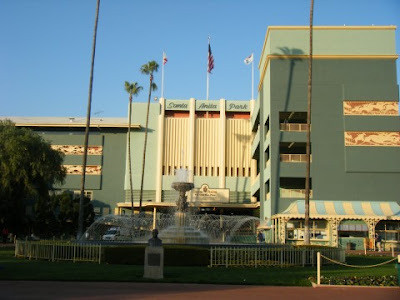 Since opening, the Santa Anita Park has been featured numerous times on film and has been a playground for Hollywood celebrities such as Fred Astaire, Bing Crosby and Spencer Tracy. The racetrack is located at 285 W. Huntington Drive, Arcadia, CA. - not far from Los Angeles. At the end of the film, Mason's character drowns himself in the ocean. His funeral is held at Church of the Good Shepherd in Beverly Hills.